Real Madrid’s Portugal striker Cristiano Ronaldo was crowned the best soccer player in the world for the second year running at FIFA’s The Best awards gala on Monday. The four-time Ballon d’Or winner won a La Liga and Champions League double with the Madrid club this year, striking twice against Juventus in the European Cup final to help Real become the first team to retain the trophy in its current format. Barcelona’s Argentina forward Lionel Messi, who has won the Ballon d’or five times, and Paris St Germain’s Brazil forward Neymar were runners up for the award voted for by national team coaches and captains plus the media and fans. 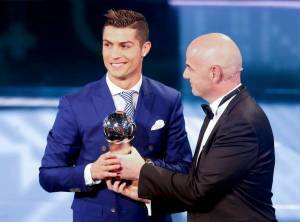 The Best FIFA Men’s Player award and the Ballon d’or, which is voted for only by the media, are now separate awards. Real Madrid’s French coach Zinedine Zidane won the manager of the year trophy for his part in the club’s success.